I'd like to make the case for Investment Seminar, but I'd also like to stress that the case is not clear cut. When considering this card it's really important to think hard about the massive downside before you start fantasising about the potential upside. Just for a moment consider Investment Seminar as pure economy. Both the runner and the corp get 3 cards, but the runner has spent a card and a click to make that happen. If you just count up the numbers then the runner is down on the deal by a significant amount. That fact means that this card is unsuitable for a lot of decks. If you're not putting significant, direct pressure on the corp's ability to play cards Investment Seminar helps them more than it helps you. Of course it's not that simple. Say you play Investment Seminar when the corp is at their maximum handsize. After their mandatory draw the corp is four cards over their maximum but has only three clicks with which to play. Even if they play a card with every click they'll usually lose a card at the end of their turn. On it's own this isn't good enough to justify the Seminar; the Corp's net gain of cards is still equal to the runner's. Additionally, they've chosen which card to lose - a kind of mini-Daily Business Show effect. Nonetheless, it's a step in the right direction. Forcing the corp to overdraw and discard either increases the agenda density of HQ or dumps agendas into archives. This plays into the Criminal faction's strengths of HQ access and broad early pressure. The most obvious synergy here is Account Siphon. No, not Laramy Fisk, he's awful. Account Siphon. And maybe even Vamp. All the econ pressure. Emergency Shutdown. Crescentus. If the corp is broke, they can't play any of their shiny new cards. Their new cards aren't shiny at all - they're a painful memory of a carefully constructed strategy destined to be thrown into archives after a bitterly resented turn of clicking for credits. That's the best case scenario and it is awesome. Criminal aggro is where this card lives. It's not about gaining advantage, it's about exploiting advantage. It's about kicking the Corp while they're down. You don't have an end game, you only have now - but right now the Corp has 9 cards, 3 agendas and 0 credits. Good luck with that Corp. I believe that the potential of this card makes it worth playing despite its drawbacks, but let's get real for a second. If this card is in your deck, you'll often draw it at a sub-optimal time. If the corp has only a few cards or is flush with credits, you'll be wishing this was something else. It's not an unproblematic 'good-stuff' card like Diesel. I think Investment Seminar can be OK even when it doesn't shine though. Your deck needs the potential to exploit it fully in order to justify the opportunity cost of playing it, but if all doesn't go to plan then it's not worthless. The trick is picking your moment. Say the corp has 5 or 6 ; If you can play a strong run then being overdrawn gives the Corp an uncomfortable choice: go broke to rez ice and lose cards next turn, or conserve resources and cede accesses to the runner. If the corp is looking to score an installed agenda, a similar dilemma can be created: Score the agenda and discard valuable cards, or spend a turn playing out cards and give the runner another opportunity to run the remote. There are other uses too. If the corp is playing with a small hand, then Legwork can become a bit like The Maker's Eye. 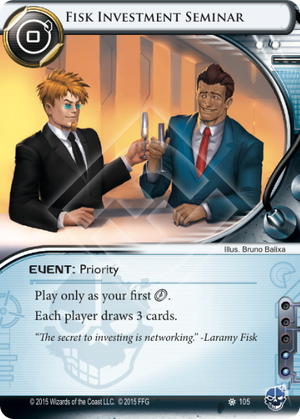 Conversely, if R&D is an open goal but you've already seen the top cards, Investment Seminar can give you new accesses. I'd like to take a moment to say I'm not convinced by this out of faction. Two influence is two too many when you have either I've Had Worse or Diesel in faction. Noise especially is probably not a fan. Good players rush against Noise to combat his inevitability. Extra card draws help them do that, they're not bonus mills. All in all I'd say this is an extremely high-skill card. Sometimes it will be a big win, but at other times you will have to think very hard about if, when and how to use it. I think that's what makes me like it so much. Fisk Investment Seminar plays into the best trait of criminals - creating and exploiting weakness. The flow of cards for the corp will always be: R&D >> HQ >> Remotes (or Archives). Think of F.I.S as pulling agendas from R&D into play before the corp can safely score them. With Leela Patel: Trained Pragmatist as a speed bump and constant Remote pressure, suddenly the corp starts filtering agendas for you in HQ. Criminals running F.I.S aim to be faster than the corp. Needless to say, the draw efficiency is used to build up your economy, breaker suite, and ultimately threat. Slow down the corp and speed up your game with the typical criminal bag of tricks - Account Siphon, Emergency Shutdown, and even Bank Job. F.I.S's true synergy lies with HQ Interface and Sneakdoor Beta - HQ Lock, the less popular cousin of R&D Lock. For the corp, being HQ locked means that any drawn agenda must be installed or trashed immediately due to the risk of them being stolen. What happens when they are unable to install or trash them safely? It gets stolen. F.I.S speeds up this process, denying the corp time to build up credits. Running on the turn F.I.S is played also gives a chance to access freshly drawn agendas before the corp can even touch them. After playing F.I.S and installing your first HQ Interface, the corp would play their excessively drawn cards too. Typical glacial corps will spend their turns playing economy and layering up ICE on HQ, R&D and their scoring server. This leaves little to no ICE on Archives and very often at least one agenda in HQ - perfect for Sneakdoor Beta. You can be even more sure of this when you haven't seen a single agenda, yet an asset like Adonis Campaign is in the well defended scoring server. With your HQ Interface installed from the previous turn, it's time to work the back door. Other utility cards include Inside Job to threaten big scoring attempts. Hades Shard to swipe agendas in Archives hiding behind Jackson Howard. So, when to play this card? Personally, I just play it when I need to draw cards on my turn. That's it. No fancy "timing is everything". The notable exception being hand-less corps. Let them waste a turn or two to draw up before playing F.I.S. Otherwise, a well balanced deck should be able to play F.I.S most of the time. There is no need to save it. I've always had a really hard time piloting Criminal decks. First, big plus is that it's got the draw efficiency of Diesel. Yeah, it's a priority event, so it's not strictly as efficient as Diesel, but it's still great. As a side benefit, you can use this to screw the corp as necessary. If HQ is full, now they'll have 9 cards in hand at the start of their turn. If HQ is empty, now they're a prime target for Legwork, or Sneakdoor + HQI buggery. Force them to add new cards to HQ faster than they want, and then start slamming into it for those sweet sweet points. All the while, you're drawing into your tools to get in easier. Just awesome.